According to the related FoS achievement (하스스톤, 하지 않겠는가?) this mount will be obtained from some kind of a promotion with the new blizzard game Hearthstone. This means that getting the achievement 하스스톤, 하지 않겠는가? will (most likely) NOT be gotten from purchasing a card pack during the Hearthstone Beta. Learning the mount also rewards the Feat of Strenght 하스스톤, 하지 않겠는가? I can confirm today that both Alliance and Horde receive the Blue 하스스톤 귀환마. 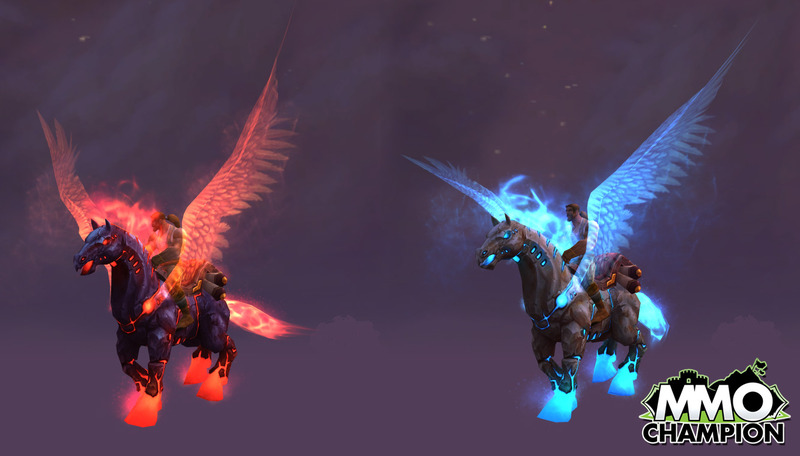 This mount is just a reskin of 티리엘의 군마 with different wings and no armor. Please note that as this is a promotion, the mount and achievement will likely only be obtainable for a short time, so if you want it, you should act before it is too late! Zeriyah has stated on Twitter that the achievement for the 하스스톤 귀환마 is NOT a limited time offer. To celebrate the official release of Hearthstone: Heroes of Warcraft, all players can participate in a few launch day activities, as well as unlock the 하스스톤 귀환마 mount in World of Warcraft. The mount is rewarded for playing, and winning three games in play and/or arena mode. Games won before the public release patch went live does not count towards this total. After you have won three games, you will be awarded with the achievement in Hearthstone, and you will receive an ingame mail in World of Warcraft from Mei Francis with your 하스스톤 귀환마 mount attached. When you have learned how to summon the mount, you will also be rewarded with the 하스스톤, 하지 않겠는가? Feats of Strength. Interested in adding the 하스스톤 귀환마 to your World of Warcraft mount collection? "발굽을 디딜 때마다 당신에게 패배한 세 명의 분노가 들리는 것 같습니다."